Ask any tribe in North America what they think about promises from a governmental body. Then take a look at the recent climate change agreement coming out of Paris, France. Perhaps this time will be different -- it would be an incredible progression of mankind's relationship to our one and only home if it is. Until then, I will continue looking to the grassroots advocacy that has defended Mother Earth again and again. 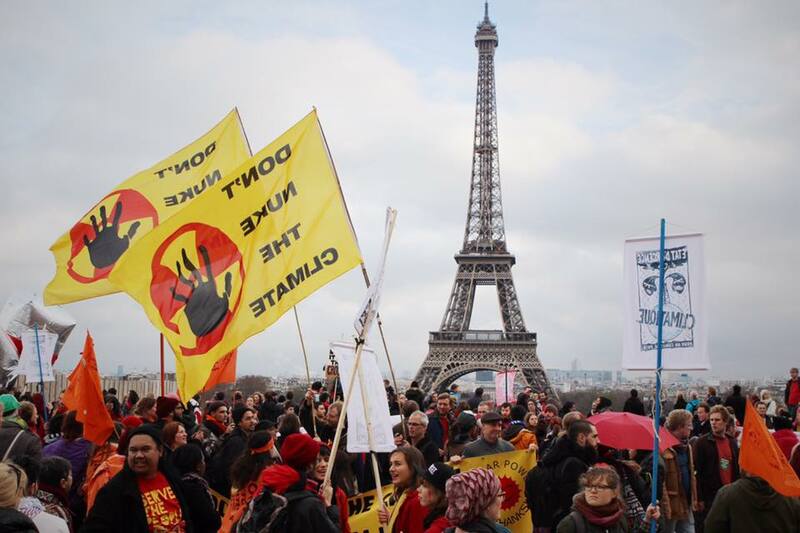 The 21st Annual Conference of Parties (COP21) concluded on December 11, in Paris, France. Weeks of negotiations resulted in an agreement hailed by many as a historic step towards substantively addressing climate change. The world's leaders agreed to "pursue efforts" to limit the globe's increasing temperatures to 1.5C. The agreement goes into effect in 2020 -- we've got four years to pull it together. Scientists worldwide have agreed that 2C is the point at which catastrophic outcomes like rising seas, food and water insecurity, severe storms, and drought will become routine. At first glance, the Paris agreement aims to do just that. The key word there unfortunately being "aims." The plans submitted actually equate to a 3.5C temperature increase, so global catastrophe remains the name of the game. But in the streets, negotiations of a different kind took place. Undeterred by the ban on demonstrations, environmental protectors from all over the world had gathered in Paris to demand change. Government promises and lofty ideals weren't enough. Leading the charge were frontlines communities. 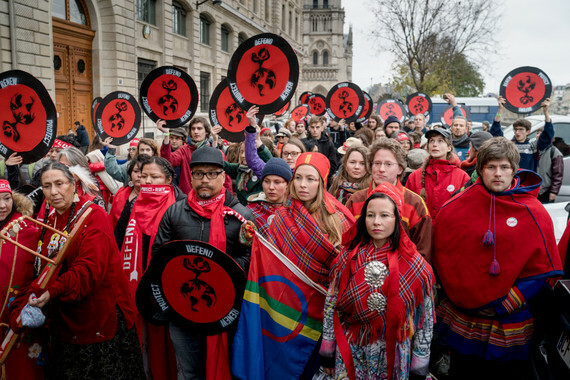 Indigenous peoples, disparately impacted by extractive industries across the board, made their presence known. Here were the Sarayaku, who had transported a hand-carved 30-foot canoe from the Ecuadorian rainforests. Here were the Sámi, with their beautiful voices carrying across the Seine River. Here were the Māori, welcoming the Embassy of Indigenous Peoples into a tiny Parisian venue. The disconnect between the "inside" and "outside" of COP21 was palpable. While governmental officials and accredited delegates argued about legal frameworks and carbon offsets to justify continued extraction, the people shared stories of homelands disappearing beneath rising seas, decimated forests, cancer clusters, cultural destruction, and boil water advisories with no end in sight. Though these stories were often told with shaking voices and tear-stained faces, the atmosphere in Paris was not one of defeat. Hope, resolve, and indomitable strength pulsated through the air. These were the communities blockading their lands, defeating pipelines, occupying government agencies, throwing wrenches into multi-billion dollar corporations at every turn. And like the grassroots movement that stopped the Keystone XL project from transporting tar sands out of Canada, so too was the media documenting the occasion. Al Jazeera, Democracy Now! and 350.org fired content across the Internet. The Indigenous Environmental Network received upwards of five million hits per day. The climate change narrative was not within the halls of bureaucracy, it was on the ground with the people, by the people. The Paris agreement gave us promises over binding commitments, it gave us "should" instead of "shall", and a complete lack of enforceability regarding the rights of indigenous peoples, migrant communities, and other vulnerable groups. But it did mark a coming together to collaborate about the greatest threat facing our planet, which in and of itself is historic. We know the fight against climate change cannot and will not be won through well-meaning rhetoric put out by those in elected positions. The growing swell of social justice movements and environmental awareness has shown the world our messages will rise from the ground up. If the COP21 governmental bodies learned anything from the coalition-making and solidarity in the streets of Paris, let's hope it is an understanding that our voices are powerful enough to stop mega-industry in its tracks. Cutting us out of the conversation isn't going to stem our efforts. We are many, we are organized, and we will not stop. This piece was originally published at Indian Country Today.